Miklosi doet nu ruim 20 jaar ethologisch onderzoek aan de universiteit van Boedapest en leidt nu het Family Dog project. In 2008 publiceerde hij zijn boek Dog Behaviour, Evolution, And Cognition (Oxford University Press). Het Family Dog Project is het eerste onderzoeksteam wat geheel gewijd aan de evolutionaire en ethologische fundamenten van de hond-mens relatie. Hoe heeft deze bijzondere band tussen mens en hond zich kunnen ontwikkelen? Geestelijke vermogens van honden, de relatie tussen honden en mensen, hondengedrag, communicatie bij honden, sociale relaties, persoonlijkheid, cognitie, sociaal leren en wolf-hond vergelijkingen. Thinking – or Latin cognition “is a controversial concept in behavioural biology. The problem is even more complicated in the case of the dog where it often happened that some experts may report on “talking”, “reading” or “counting” dogs with any (or little) scientific evidence, and in most cases detailed studies did not support these early assumptions. Few people would deny that dogs do not feel emotions, but only a few researchers agree on how this common knowledge could be proved by the means of scientific method. 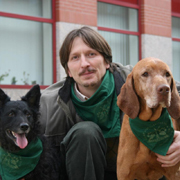 In this seminar we will discuss the results of modern research on cognitive abilities in dogs and also problematic issues of detecting emotions in dogs. It turns out that dogs use complex thought processes when communicating with people, but they can be sometimes very sensitive to specific signals. The social environment plays an important role in their performance, and in dog training, one should also understand the cognitive and emotional abilities and limitations of the dog. Zondag: Are dogs like persons? The concept of personality in dogs Personality is an abstract concept on the context-independent stability of behaviour. There are many other definitions in animal or human psychology, but this descriptive definition is very useful for us because we can treat human and animal characteristics in the same way. Dog training experts often speak about “character” or “Wesen” to avoid the word “person”, but this is basically the same issue. It is more important that people understand how researchers or dog training experts can determine the personality of the dog, and what are the advantages and disadvantages (limitations) of the different methods. There are many alternatives if you want to determine the personality of the dog. You can ask the owner about his/er dog, or directly observe canine behaviours spontaneously or in specific behavioural tests. No solution is perfect. This time I will compare different so-called personality tests (including questionnaires and behavioural observations), and report the latest results of our Family Dog Project, and discuss how some personality traits are related to genetic factors. Participants will also have the opportunity to fill out some questionnaires for the study of personality.